Charlie Chaplin was one of the biggest stars in Hollywood’s silent movie era. But was he a precursor to Internet humour? He is now being dubbed the “inventor of memes” on Reddit due to the resemblance between a still from his 1922 film Pay Day and the 2017 “distracted boyfriend meme“. The image has been liked almost 300,000 times on Twitter, with people making their own memes about the coincidence. Distracted boyfriend. It’s the name given to a widely-shared stock image of a man looking at another woman while out with his partner. Variants of the image were ubiquitous with social media in 2017 as people used the image to represent the feeling of coveting something they wanted. A year later, the meme has seen a resurgence through an unlikely source as Charlie Chaplin has now been dubbed “the original” distracted boyfriend. Some variants of the “distracted Charlie” meme are jokes about the time period, with one user imagining how Chaplin felt about “talkies” – a colloquial term for film with audible dialogue. While some people created variants of the meme that referenced people in 2018 coveting the Chaplin still, others used the “distracted Charlie” meme to call attention to the surge of posts. Though they seem to have struggled with how to spell his name. Is this the original meme? We previously suggested that “the first meme” – a format-dependent joke, typically of a picture with a caption or subtitle – may have been published in 1919. 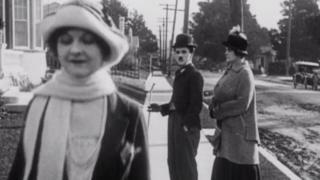 It would be more accurate to call Chaplin the original distracted boyfriend, though there is no suggestion that the 2017 meme was based on Chaplin’s 1922 film. Besides, there is one glaring difference between the two – it seems that the original still, taken from the 1922 film Pay Day, was mirrored to better resemble the meme. Fortunately, a Twitter feed specialising in moving images from silent film has provided the original footage.